In PowerShell 5.0, Microsoft introduced the PowerShellGet module. This module contains cmdlets for different tasks. E.g. it lets you easily install / upload PowerShell modules / scripts from and to an online gallery such as PowerShellGallery.com. It even lets you find scripts, modules and DSC resources in such repositories. This is a fantastic way to share your script goodies and make it available to others, who can use them on-premise or even in Azure Automation for their runbooks or DSC projects. In every collaboration scenario, there must be some rules. Publishing scripts has also some rules to follow, otherwise all scripts will end in a chaos and no one will ever find an appropriate script with the latest version etc. Therefore we need to provide structured data for version control, prerequisites and author information. This can be done using the PowerShellGet module. As you can see, there is a difference in version and cmdlet count. If you think now, that you could just upgrade the PowerShell version to the latest release on your Windows 10 box, well you need to wait until end of February 2016. Microsoft has pulled the latest RTM release back, because of some major issues. Find the post and details of the status on the PowerShell blog . 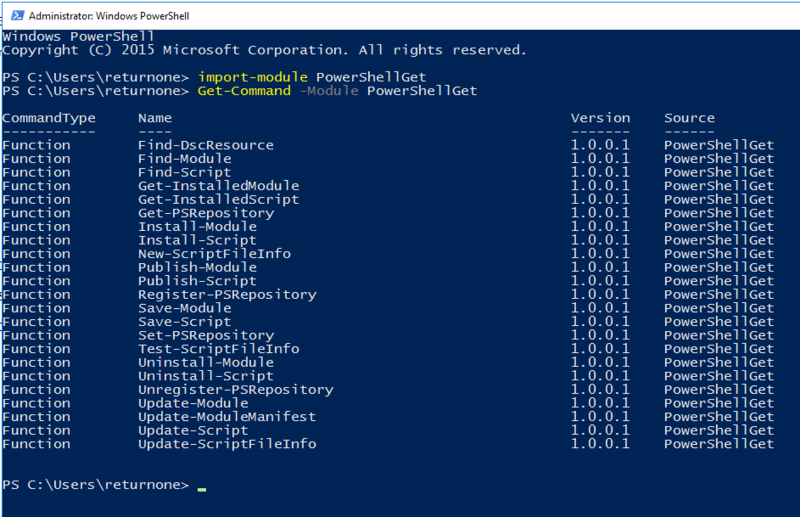 If you managed to get to the latest release of the PowerShellGet module and you have the full set of cmdlets available, you are ready to start. Let’s assume we want to publish a PowerShell script to http://PowerShellGallery.com . 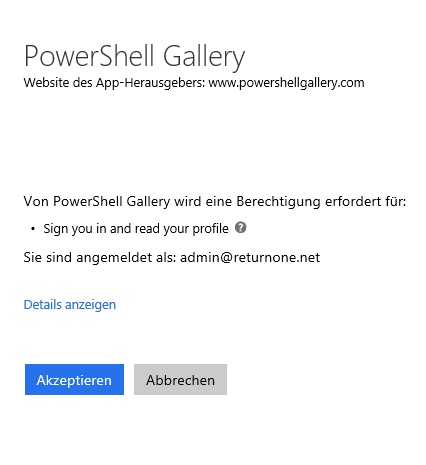 Before you can start, you need to register with your Microsoft or Organizational account and then you will be ask to give PowerShell Gallery access to your account. After registration you will get a key which will be needed later for uploading your files. This will create a new script file with a bunch of header data. As I have mentioned before, a must requirement are only VERSION, DESCRIPTION, AUTHOR and LICENSEURI, if you want to publish your script. 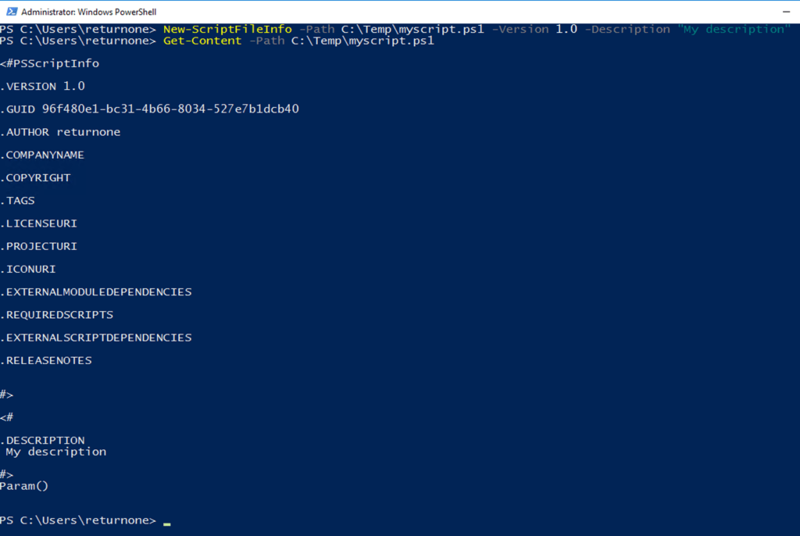 If you don’t add this data, the Publish-Script or Publish-Module cmdlet will complain and you won’t be able to upload the files to the PowerShellGallery.com . After you finished editing the data and you feel like having everything the way you want it, then you are ready to publish your script. As an example I have just played with it and this is, how it could look like…. If you already have a file written and you just need to update the metadata you could use Update-ScriptFileInfo -Path “C:\Temp\Script.ps1” -Version 2.0 –PassThru. I was not able to do so, the cmdlet always failed requesting to provide all parameters (null value was not allowed). After removing the line break, the Publish-Script cmdlet worked perfectly. I could reproduce the error and each time I saw this problem. The encoding was UTF-8 and just a plain text file / script. If you want to know more about publishing scripts to PowerShellGallery.com go to that site and explore it. If you want to know more about the PowerShellGet module in general, which is available in PowerShell 5.0 go to TechNet here . The idea behind these cmdlet is very cool and also easy to use, but there is still some work to do fixing some of these bugs. I have also had trouble using both the Publish-Script and Publish-Module cmdlets. They fail with a message that says the created NuGet package doesn’t exist in a folder under the user’s AppData folder. I haven’t figured this one out yet.